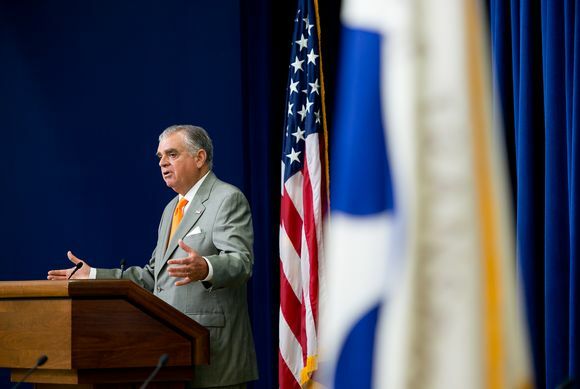 U.S. Transportation Secretary Ray LaHood. Photo: U.S. Department of Transportation. LaHood’s relentless campaign against distracted driving, his safety-first mantra and his determination to visit every state in the union gave the Peoria native a higher profile than several predecessors in the role, traditionally played out in the shadow of more glamorous Cabinet jobs. As the Post article states, there has certainly been rumor mill speculation about who will be the next transportation secretary. This game, of course, has been in play for the past several months but I’ve yet to see a single media story mention a source’s name or affiliation so readers can judge whether that information is reliable. With that significant caveat, Los Angeles Mayor Antonio Villaraigosa’s name has surfaced in several media reports and that’s certainly interesting given his role on the Metro Board of Directors for almost eight years and his push for expanded federal funding of local transit projects. We helped jumpstart the economy and put our fellow Americans back to work with $48 billion in transportation funding from the American Recovery and Investment Act of 2009, and awarded over $3.1 billion in TIGER grants to 218 transportation projects across the Nation. We have made unprecedented investments in our nation’s ports. And we have put aviation on a sounder footing with the FAA reauthorization, and secured funding in the Moving Ahead for Progress in the 21st Century Act to help States build and repair their roads, bridges and transit systems. My own take: I think Secretary LaHood deserves enormous credit for elevating the conversation about distracted driving and cell phones. As recently as five years ago, there wasn’t a lot of information about the scope of the problem or some of the tragedies that resulted from it. LaHood turned it into a national conversation at the same time that cell phones were becoming even more ubiquitous and distracting with an array of new features. Texting and cell phone use while driving certainly remains a significant problem. At least — thanks in part to Secretary LaHood’s efforts — we know it’s a problem, the first step toward saving lives. Secretary LaHood, I also think, deserves enormous credit for demonstrating that bipartisanship is still possible at a time when Congress has become a gridlocked mess and, according to the polls, a national embarrassment I’m sure it’s not easy for a Republican to take a job in a Democratic administration yet LaHood did and was able to find common ground with President Obama on matters of upgrading the nation’s infrastructure. As for the push for high-speed rail — especially here in California — we’ll see how that investment goes. Intercity rail travel on Amtrak certainly will get a boost in some other parts of the country but it remains to be seen whether the bullet train project here (which is a much larger and expensive proposition) can be fully built without massive federal help beyond the dollars already secured. The televised debate Monday night largely focused on the city’s finances but the five candidates for Los Angeles Mayor all said they would like to see the Crenshaw/LAX Line have a Leimert Park station. At present, it’s considered an optional station that will be built if a contractor can construct the underground station within the project’s budget. The project is presently out to bid and there’s no date yet when the Metro Board of Directors will take action on a construction contract. The next mayor takes office on July 1. Here’s a six-minute video excerpt from KNBC with the candidates talking about LAX. Called “intrusion detection,” the system would use sensors to determine if someone is in danger of getting hit by a train — which would sent off alarms at the Rail Control Center, who can tell subway operators to slow down. Another option is to install a flashing light on the platform that would notify riders, MTA employees, and subway operators that someone is on the track, said acting MTA chief Thomas Prendergast. He also panned the $1 billion idea — suggested by politicians — that the MTA install sliding doors throughout the system that separate riders from the subway tracks. I believe the contractors all submitted their bids back to the MTA on the Crenshaw Line. I know Metro will have to go through them and pick a winner, so hopefully we’ll know if there is a Leimert Station in the next couple of months. which is one of the bigger problems we face in this country. One quicl look at the numbers and you will agree. Thermal cameras with a viewing area of only the track area should work in the below grade stops. A big tip of the hat to Ray LaHood, for a job well done. Lets hope the next Trans. Secretary continues the momentum, and gets the ball rolling on many more projects! I believe the that Metro included a condition in the contract that if the contractor builds the Leimert Park station it must also build a station in Westchester. It will be interesting to see if the contractor can build both stations within the budget that Metro has approved for the Crenshaw Line. The stations were given priority: Leimert Park first, Manchester second. It’s worth noting that LaHood is not stepping down *until his replacement is confirmed*. Given that the accursed US Senate just agreed to allow any nomination whatsoever to be filibustered or subject to “holds”, there is no guarantee that any replacement will be confirmed. Many federal positions have been sitting open for over 4 years because of the irresponsible behavior of the Senate. So LaHood could be there for the next 4 years. Or longer. Talk has been that LA Mayor Tony V will replace LaHood. Tony’s term as Mayor ends in June. With LaHood saying that he would stay until his replacement is confirmed could mean that Obama will chose Tony V and LaHood would stay on board until June.